Sony has quietly re-posted the CZ 24mm F/2 lens to the "fixed lens" listing in their US website. It also looks like they made sure the description didn't have any remnants of the 24-70mm zoom in it. That's good, and I hope there aren't any problems bringing it to market. This lens rental site has come out with a lens repair rate chart for the lenses they rent. First and second on the list are Sony, with almost a third of the lenses needing to be turned in for repair; the two lenses listed are the CZ 24-70mm and 70-200mm. I have both and never have had a problem with them. In fact, I've never had a problem with any Sony lens. They also say Sony repair charges will make you spit up your morning coffee, as compared to a Canon, I can believe that. I don't see any Tamron lenses on the list, and it doesn't surprise me, all my Tamron lenses have been perfect. August homepage entries are now in the archives. If you saw something below that isn't there now, don't fret, it will always be available in the archives. Some folks are wondering about the flash extension for the 18-200mm NEX lens. I talked to a US Sony sales rep, and he told me that the flash extension is only included with the purchase of a NEX camera and 18-200mm lens, in kit form, (NEX5H). All other purchases, like the 18-200mm alone, or in conjunction with a NEX camera kit, (18-55mm/16mm) will require you to purchase the flash extender separately. If you go here, you'll discover in order to take proper flash pictures with the 18-200mm, you'll need to fork over an additional $63, (or more like $70 with shipping and tax) for what Sony is calling an extender assy for dig camera, shown below. You'll also discover that the extender is on backorder, and will not be available until at least October, according to the rep I talked with. I consider this marketing scheme (US, not sure of other regions) to be a bit sketchy for an $800 lens, and a price of $63 for a simple molded piece of material (probably ABS) is a massive profit generator, and a rip-off in my opinion. I encourage everyone that buys the lens to call Sony service and ask why it isn't included. Check out my full review of the new Sony NEX 18-200mm F/3.5-6.3 OSS lens, it's a long one, and chock full of sample crops and comparisons, so dial-up users be patient while the page loads. I went ahead and did a quick comp with this lens and the Sony 70-200mm F/2.8 at 200mm, just to see what the real differences are, you may be surprised, or not! I know it's not a fair test, but it was fun to do anyhow. It's at the bottom of the review page. This brand new, just released NEX E-mount super-zoom lens turned in a decent review over-all. Oddly, the most notable characteristic is probably the build quality and feel, it's very nice, and much more so than the typical Sony alpha branded lenses. The next most notable feature is the actual resolution, it's pretty high, especially at the short end, with the whole image exhibiting good contrast at F/5.6-8. Unfortunately, as you zoom out, the contrast erodes rapidly, and you're left with the typical super-zoom (slightly washed out) look. There are some other areas where the lens could do better, like the macro shot (poor for an $800 lens), and color fringing, (typical amount), and the focusing issue, (as describes in the NEX camera thoughts), even worse with this lens at the long end. One item that stands out a little (because I've never seen it quite like this before) is the light fall-off pattern at 200mm, F/6.3. It forms a distinctive circle because of a very narrow transition zone, I have some samples in the light fall-off section. It's all in the review so click the picture below. Great new from Photokina; Sony says a new intermediate level DSLR will likely be available by next summer(!) Yup, that's the news we've been waiting for---isn't it? I've got a good jump on the new Sony NEX 18-200mm F/3.5-6.3 review, and should have it ready next week sometime. Instantly noticeable are the high build quality and smooth zooming and focusing, all are much better than the Carl Zeiss 16-80mm. Image quality takes a serious back seat to that CZ lens, at least at the long end, which is no surprise if you're familiar with super-zooms. Although the NEX 18-200mm is not in the same class as the CZ 16-80mm, it is slightly more expensive. It's also not in the same class as the Sony 70-200mm F/2.8, but that won't stop me from doing a comp at 200mm just for fun. Has Sony pulled the plug on the Carl Zeiss 24mm F/2 lens? It does not appear anywhere on their site as of 21:44, 9/12/10 EST. Apparently, Sony's US website was down on Saturday for maintenance(?) As I was trying to update some links to the CZ 24mm F/2 lens I noticed it was gone on the Carl Zeiss lens page. Could it be a mistake? Or is Sony having troubles again? Since last week, Sony has very quietly pulled the A560, A580 and CZ 24mm F/2 from their US website, I'm not sure about other places. Very strange actions here. I remember the date when the CZ 16-80mm was promised, and it ended up being released six months late. Check out this article, and then here, if you're looking to improve on your interior photography skills. It's about a bird that skillfully builds a colorful, and visually appealing room to show off his artistic talent, and himself. Most humans don't care much about this, or aren't clever enough to pull off something similar in order to help make their pictures better. Sadly, when it comes to photography, people prefer to substitute preparation and hard work by buying the newest camera, crossing their fingers, and firing away in gay abandon in hopes of getting at least one decent shot. This method usually ends in disappointment, although dumb luck sometimes wins the day! Apparently, Sony has decided to pull back the A560/580 release for the immediate future. The cameras are no longer listed on Sony's US website. This is really weird, and I don't think I've ever seen that happen before, at least with Sony. 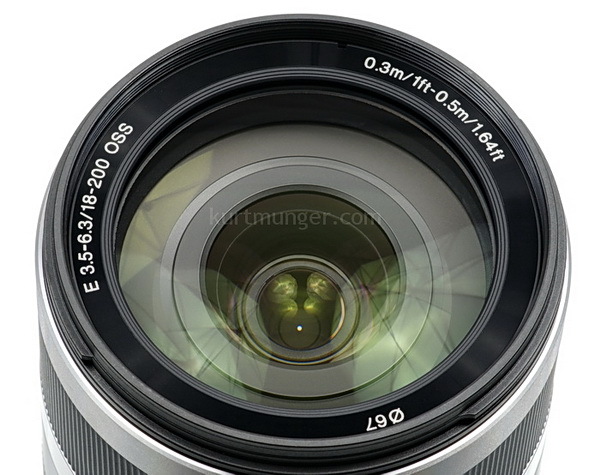 Another item that seems odd is the absence of the NEX 18-200mm lens which was supposed to be released this month. It hasn't appeared on Sony's US website yet. A possible firmware update on the NEX system to support AF on SAM/SSM lenses? For more questions and possible accurate answers, go to Sonyalpharumors.com. The guy that runs this site must have some inside contacts from Sony's camera department, because it looks to me like there may be more than just a kernel of truth to some of the rumors. In unrelated news; an upcoming article I'm working on contains a study of optical inconsistencies as a result of normal lens/camera-mount play. I've been wondering about this issue for quite some time, and have finally found some time to collect my thoughts and put pencil to paper. At first glance this probably seems like a really boring read, but everyone concerned about peripheral sharpness will definitely want to check it out, it'll be quite surprising! I forgot to mention a couple of things about the NEX cameras in the entries below. First, I think the cameras only make sense when used with a small lens, because the whole idea behind the NEX system is small size. When you put a big lens on a tiny camera, the package is still big, sorta like using a Sony 300/2.8 with an small A290 or A55 body, because you don't want the full frame camera bulk. The little extra weight and size won't be noticeable because the lens is such a dominating factor. The current 18-55mm kit zoom lens puts the NEX cameras at the very upper end of practicality. Another idea might be for Sony to offer some Carl Zeiss prime lenses scaled down specifically for the NEX system, and possibly with the intent of trying to capture some of the Leica mystique. There are adapters out now for Leica lenses, but in my opinion, most people will want AF capabilities, and that unfortunately will hinder use with current Sony a-mount lenses, and to a lesser extent all other non-NEX (e-mount) lenses. I'm guessing the average NEX user won't pay $2000 for a Leica prime lens with no AF, and the snobbish Leica user will never allow his lenses to touch a Sony camera! Wow, it's September already, and summer is over! Now, and through the fall I'll be messing around with the text fonts here, seeing which one I like, and will eventually use for the new site design. I've been using Verdana mostly since I started the site, but I've grown to like Trebuchet MS, which has better looking kerning, with a different character aspect ratio, and most importantly makes it look like I'm writing more! I do notice it looks best when viewed at normal to larger sizes. You're reading Trebuchet MS right now. If you want a good laugh, go to Sony's US website and visit this page, where they describe (in the features tab) the new 85mm F/2.8 lens as a standard/medium zoom Carl Zeiss design that would work great using the A100 and super steadyshot system!! Also, check out the butchered description of the new DT 35mm F/1.8, where they list it as a wide angle zoom lens with an ultra-bright F/1.4 aperture(!) One final chuckle for you; go here (no link now), where you'll find the new CZ 24mm F/2 described as a 24-70mm zoom. Obviously, they're using pages from other lenses and are forgetting to change the descriptions. Still, Sony should have enough money to hire competent people to take care of this stuff. Sloppy work like this doesn't help Sony boost themselves in the intermediate/pro DSLR market, although amateurs won't notice it.